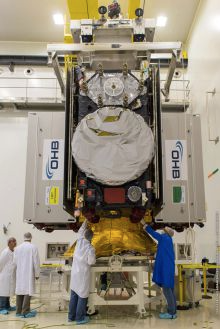 Four additional satellites have been ordered from the European Commission which has exercised one of its contractual options for the European Galileo navigation system and ordered a further four satellites from OHB System AG. Just in June 2017, the Bremen-based satellite producer had been awarded a contract for eight Galileo FOC*) satellites under the Batch 3 tender. Marco Fuchs, Chief Executive Officer of OHB SE commented that once again, the quality of their navigation satellites has spoken for itself. They are very grateful to the European Commission and the European Space Agency ESA for the confidence which they have placed in them and their partners. The contract increases the total number of Galileo satellites ordered from OHB System AG to 34. Of these, 14 are already in orbit. The satellite constellation is to be expanded incrementally. Assembly work on the Ariane 6 launcher to commence in October. Dr. Wolfgang Paetsch, who is the member of the OHB System AG Management Board responsible for navigation, Earth observation and science. commented that following the completion of the satellites under the contract awarded in June, they will be commencing work seamlessly on the four satellites under the new contract. The ambitious schedule means that looking forward reserve satellites will be available both in orbit and on the ground. The contract for the four satellites has a value of EUR 157.75 million. As with the previous contracts, OHB System AG in its capacity as the producer of the satellite platform and the system manager is responsible for the satellite design and platform, integration and verification. In addition, it will be providing support during the launch preparations and in-orbit verification. Hans J. Steininger, Chief Executive Officer of MT Aerospace AG added that production will be commencing at the beginning of 2018 at the new halls built for this purpose in Augsburg. They will be starting work on completing the upper stage tanks for the Ariane 6 at the MT hall at Bremen airport in the near future. With a floor area of 4,000 square meters, the hall has been specially built for this purpose.